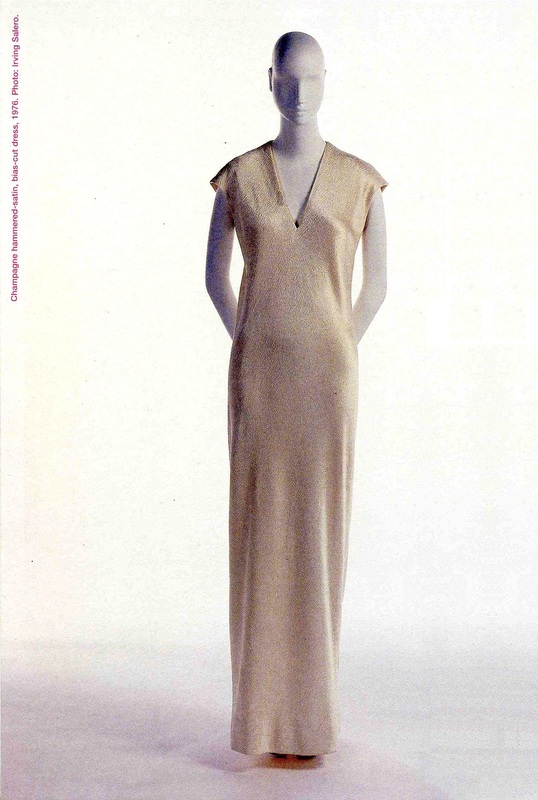 HALSTON – McCall’s 5103 Spiral Cut Dress, 1976. Well, this isn’t a ‘Vogue’, it’s a McCall’s and it’s by one of my favourite designers of all time, HALSTON. I don’t collect patterns of any brand other than Vogue, except Halston for McCall’s patterns. There are patterns which I like by designers who licensed their designs to other brands, such as Bob Mackie for McCall’s; or Rifat Ozbek, Carolina Herrera and Michael Kors for Style patterns, but I have to limit myself to Vogue, and Halston for McCall’s, to keep my pattern collecting at a manageable and affordable scale. The original company founded by Roy Halston Frowick was named ‘Halston Inc.’ and it was acquired in 1973 by the company of Norton Simon Industries, which also owned the McCall Pattern Corporation, so it is no surprise that Halston’s designs were licensed to McCall’s and not to Vogue Patterns, as some of Halston’s hat designs had been in the 1960’s. According to the book ‘Simply Halston’, by Steven Gaines, Halston’s patterns were ‘enormously popular’. 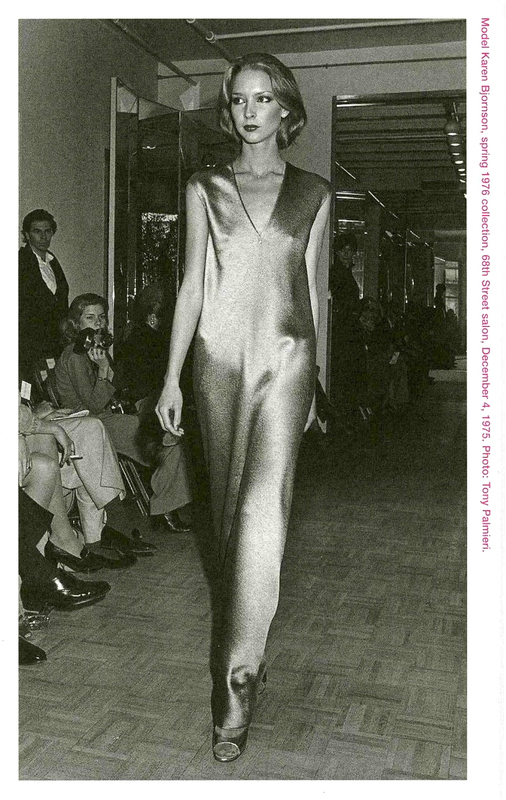 Many of the patterns have very interesting and ingenious pattern cutting and construction techniques and reflect Halston’s quest for ‘seamlessness’ in his designs, meaning that unnecessary shoulder, side and armhole seams were often eliminated so that the garment’s lines would continue from front to back ‘unbroken’ to give the appearance of seamlessness. Often this type of seaming was used for bias-cut garments. 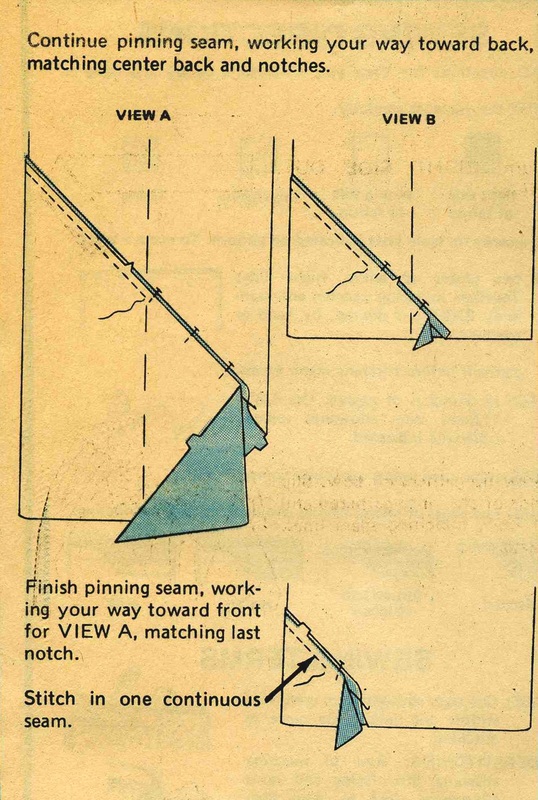 The McCall’s pattern 5103 is from 1976. It utilises the ‘tube’ cut which first appeared in Halston’s Spring 1974 collection. The ‘tube’ cut could allow a garment to be made completely on the bias, all in one piece of fabric, by spiralling a single seam around the body. 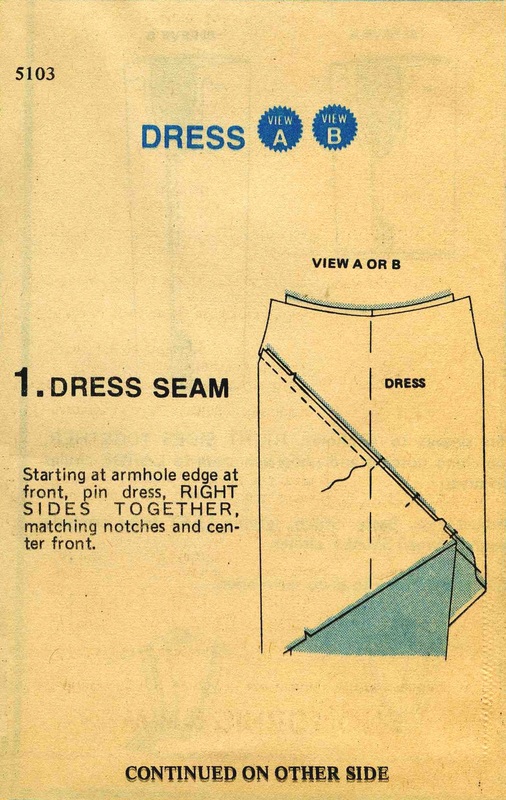 I think the way that the pattern is cut is the most interesting aspect of the design of McCall’s 5103, as the dress appears rather unremarkable in the photograph on the envelope. This may be partly due to the fabric choices and styling, and I also think it has something to do with the sleeves (on the short-sleeved version). Perhaps the short sleeves would look better if they were made shorter. Perhaps an experienced dressmaker could eliminate the sleeves all together and substitute them with narrow shoulder straps and bind the lower armhole edge. Also, to make use of the bias, perhaps a fabric with a very soft drape such as silk charmeuse, tissue faille, or satin would draw closer to the body for a more flattering and lustrous evening look. A stripe or linear print would emphasise the spiral seaming, as is utilised for version A on the pattern envelope. An ombre printed or dyed fabric with the gradation running from selvage to selvage would really look amazing! 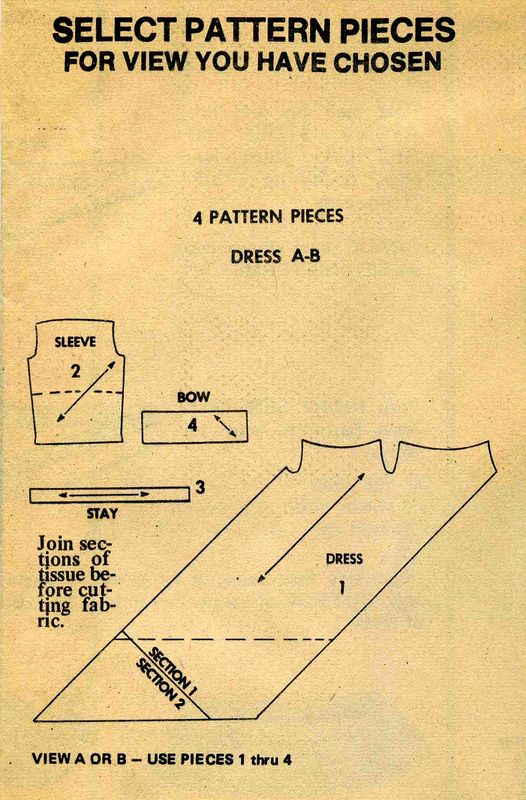 Below: The back side of the envelope and scans from the instruction sheet of the pattern list showing the shape of the pieces, and the first steps of construction for the dress showing how the spiral seam is sewn. Below: A diagram illustrating the concept of the ‘tube’ cut; a photograph of Karen Bjornson (who was once Halston’s house model and a ‘Halstonette’) modelling a tube dress in a Spring 1976 fashion show held on December 4, 1975; and a photograph of the same dress on a mannequin. 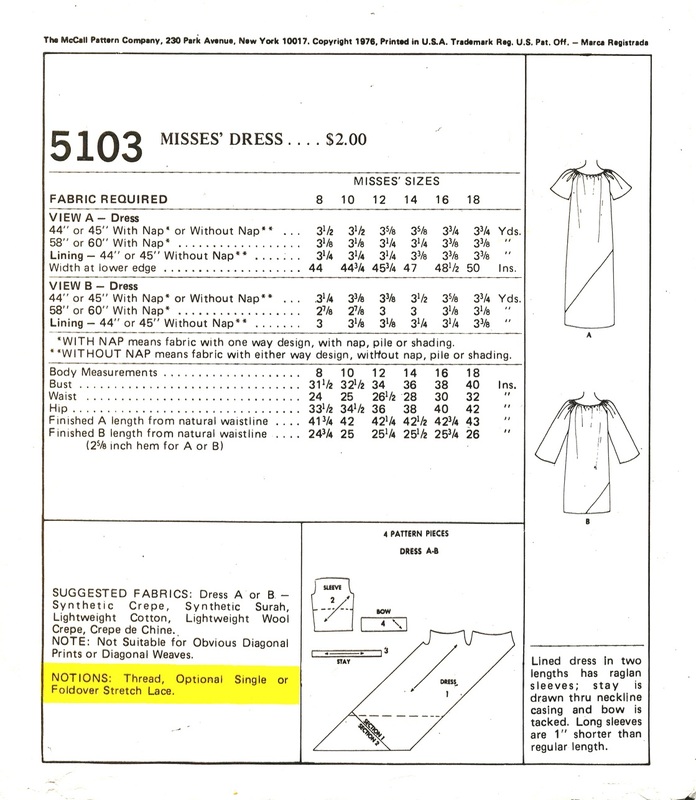 It is interesting that McCall’s 5103 is copywrited 1976, the same year as the collection from which that dress came. 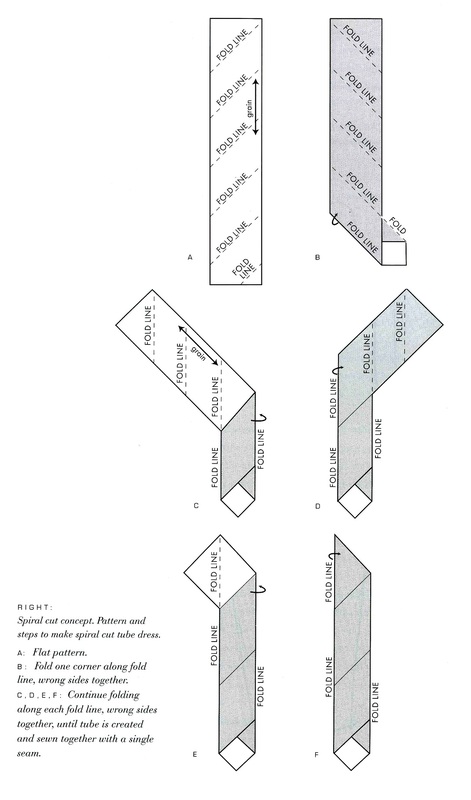 (Source: Diagram is from the book Halston: An American Original by Elaine Gross and Fred Rottman, Photographs are from HALSTON by Steven Bluttal and Patricia Mears). 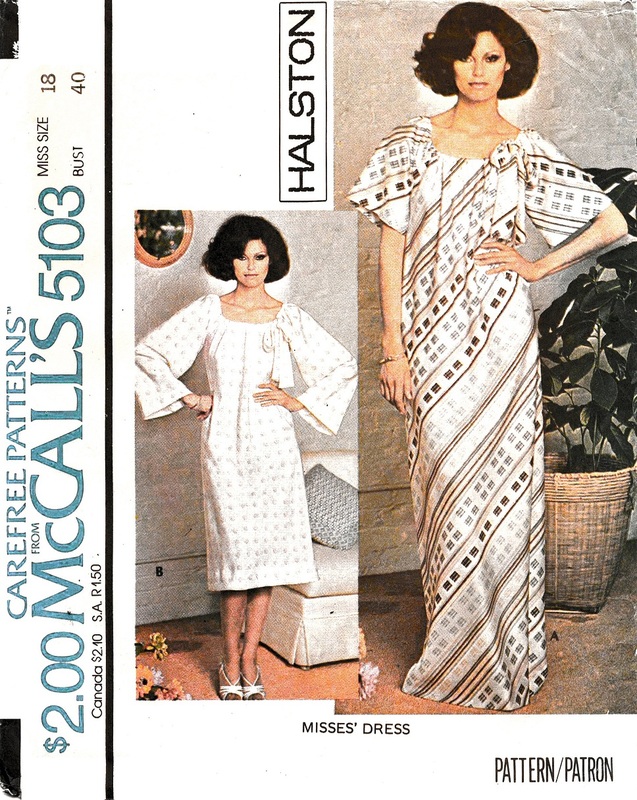 Stay tuned for future posts on other HALSTON for McCall’s patterns!